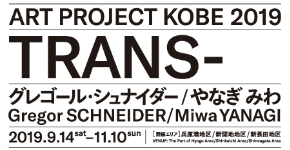 TRANS- is an art project that sets out to “transcend and move beyond” from 24th September to 10th November, 2019 in Kobe, Japan. The venues for this project, Hyogo Port, Shinkaichi, and Shin-Nagata, are areas with historical links to Kobe that are located west of the urban districts of Sannomiya and Motomachi. Gregor Schneider and Miwa Yanagi will exhibit the works in these areas.